The best tight spreads on the market from the best liquidity providers! Why BLACK FRIDAY account with NPBFX is the best choice for traders? 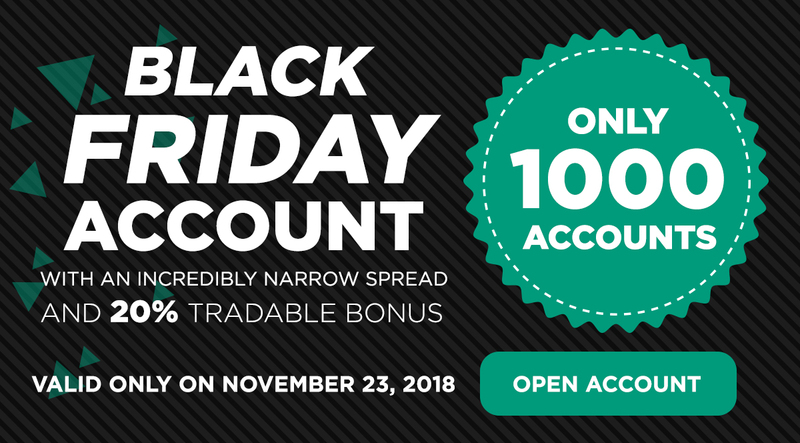 Only on Black Friday we offer our clients the opportunity to open a trading account with unique trading conditions. By choosing BLACK FRIDAY account you will get the minimum spread for the most liquid EURUSD pair as 0.2 points and the average spread as 0.5 points. Commission for transactions is not charged. Have you ever seen better trading conditions? Maybe you got accross an advertisement promising spread of 0 points? If so, then, most likely, on these accounts you will be charged an additional commission for each transaction, which is 20 — 30 dollars per lot or even more. So actually it means the “real” average spread will be at least 0.6 — 0.8 points. On BLACK FRIDAY account, all commissions are already included in the spread! Do you still know where to find more competitive conditions? Tell us where and we will give even better! The offer is valid only until the end of Black Friday. How to open BLACK FRIDAY account? — BLACK FRIDAY trading account can only be opened on Black Friday: November 23, 2018 from 00:00:00 to 23:59:59 (GMT +3). — BLACK FRIDAY trading account can be opened from Personal Office during the promotion period. — To receive a welcome tradable bonus, you need to deposit your BLACK FRIDAY account with minimum amount of 100 USD / 100 EUR / 5’000 RUB. — Bonus funds will be credited automatically for each deposit during the term of the promotion. — The number of accounts provided by the company under the terms of BLACK FRIDAY is limited. NPBFX offers a unique opportunity to participate in our regular contests on real and demo accounts. Our contests on demo accounts are perfect for all categories of traders and allow to build up trading skills without risking real money. No matter whether you are professional or amateur trader, participating in our contest is a great opportunity to test yourself at trading and win great prizes!